When I used to get my annual review at my old job, if I received a bonus I'd buy myself something to celebrate. One year I bought a Brahmin bag, one year I booked a trip to the beach, one year I pampered myself at a spa. It was a way to congratulate myself for a job well done, a year of hard work. Bloggers often celebrate a big campaign or a milestone in their career with a similar purchase. Many of us have seen the blogger who suddenly owns a Chanel bag or a pair of Gucci loafers. To get those achievements in blogging also takes a lot of work – pitching, rejection, calls, meetings, creative ideas, collaboration, editing, and more editing. So much work can go into a single blog post or photo on Instagram that most will scroll right past. I decided instead of a designer bag to buy myself The Wing. 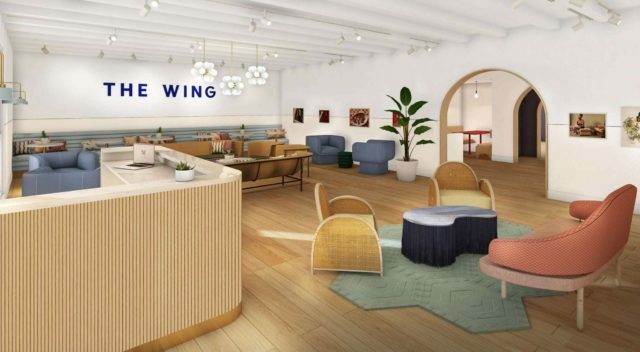 For those who haven't heard of it, The Wing is a female-only club and coworking space. The first location of The Wing opened in NYC two years ago, and this week they opened up down here in DC, Georgetown to be specific. 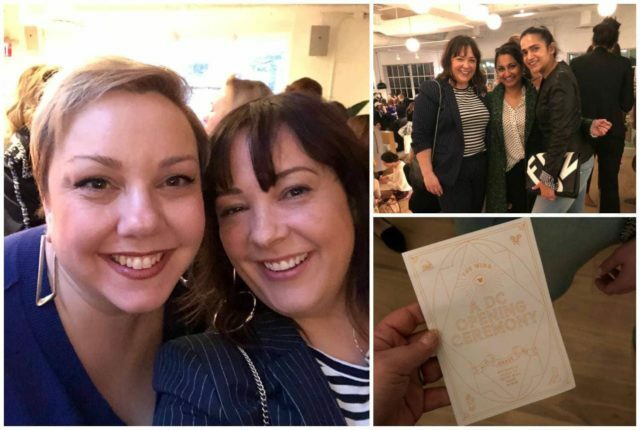 The Wing believes that the act of coming together as women creates new opportunities, ideas and conversations that will lead to greater mobility and prosperity for womankind. I love this and want to support such an endeavor. On top of that… I'm finding I get distracted working from home. I was looking to join a coworking space but wanted it to also be a way to network, socialize, and meet fellow creatives. The Wing is literally a block from my sister's office, so I can ride into work with her. 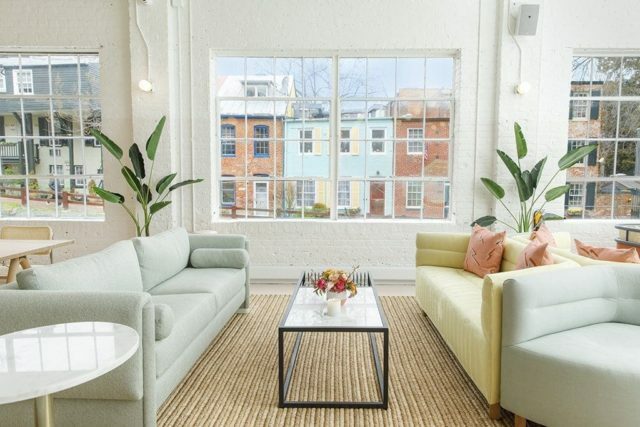 Also, being located in Georgetown, it makes it easy then to head to client meetings during the day and blogger events in the evening (trying to get to Georgetown from the Maryland suburbs in rush hour is torture… two-hour torture). I plan to go a couple times a week, while still working from home half the time. I can bring up to four guests at a time. With my sister, I bumped into my friends Prerana and Tanvi, the opening night pamphlet. The party to celebrate the opening was this past Tuesday, I took my sister as my date. My Uber ride to Georgetown was surprisingly quick and I got there 15 minutes early. Good thing, as there was already about 20 women in line. By time they opened the doors, the line reached the end of the block. The Wing said 1,200 women attended that evening. Think about that… a room of 1,200 women. Only women (okay there was one male photographer but everyone else identified as female). 1,200 DC-based creative, professional, badass, powerful women in one space. All of us were excited, so many were open and smiling and wanting to connect. I was so in awe I hardly got any photos and only shared a bit on InstaStories. All of the photos in this post except the ones directly above are via The Wing. 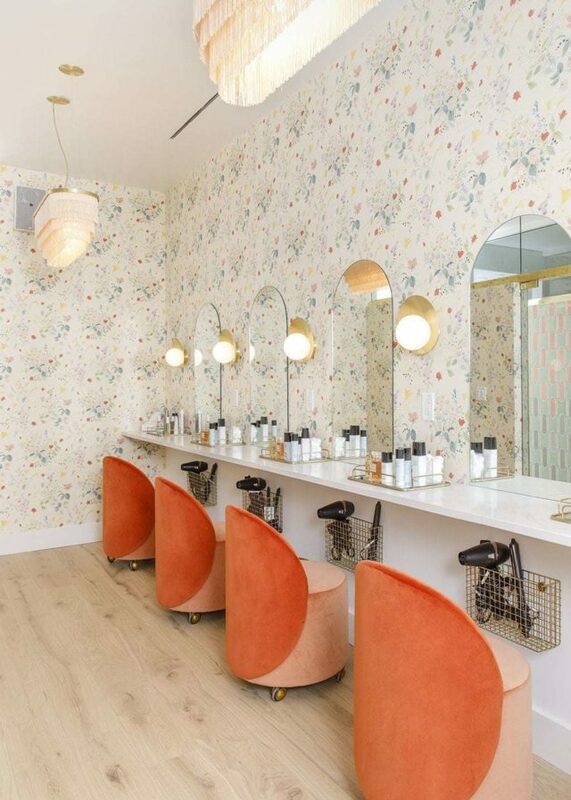 The space is utterly gorgeous and well-appointed. There's showers with toiltries, grooming areas with hair appliances and products, a restaurant, private cubicles for calls and conference rooms for meetings. There's a library (organized by color just like my living room) that is all books focused on or written by women, the largest library of any Wing locations. And the staff is so welcoming, friendly, and wanting you to feel at home. The Wing is a coworking space, but it also has so many events. Live viewing of the White House Correspondents Dinner, classes in meditation, happy hours, conversations with inspiring women (Hillary Clinton was recently a guest at the Wing NYC and they're hostng Kirsten Gillibrand and Diane Feinstein later this month), panels of authors, actors, artists, and more. All of these are free to members and members can bring up to two guests. I'm excited about this change to my everyday, and look forward to meeting the strong women of the DC area. If you're a member of The Wing (I met a couple of you Tuesday which was AWESOME), reach out and I'd love to meet up! That office is gorgeous and fits you to a T! My sister is a 100% teleworker and I don’t know how she does it! I can only handle my current once a week situation. I am sure potential brands/clients will be very impressed when they meet you at your “club.” Nice way to level up! 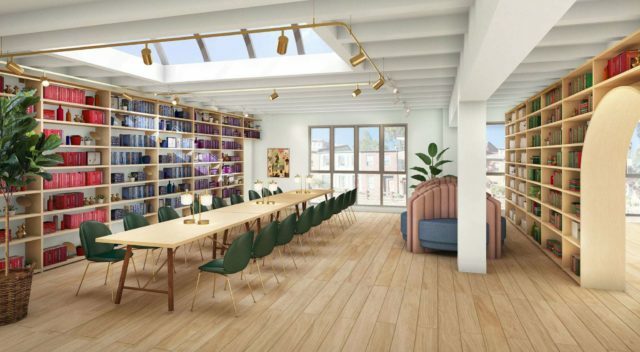 There’s quite a few SF women-only coworking spaces. This sounds like a great idea. Wouldn’t it be perfect if they also offered childcare? That would be cool but I have no idea where they would fit it, and supposedly DC is one of the bigger locations! 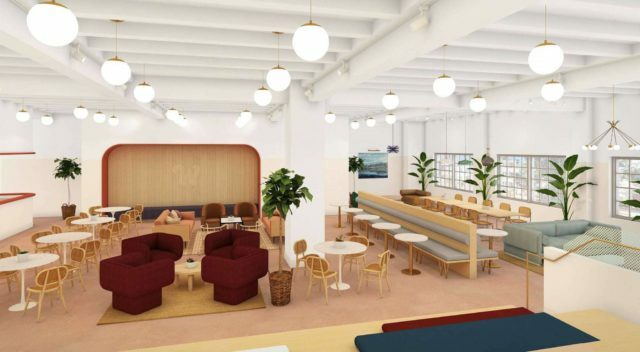 I recently listened to a podcast about these all female co-working spaces and thought it sounded fabulous. This one is truly beautiful! Thanks for sharing! They’re opening one in LA and one in San Francisco! … but why would you be investing in this service if you weren’t making at least that much for whatever you want to work on while you are there? much cheaper than renting office space? I would be. I find myself distracted at home and coffee shops around me are a premium. If I show up at 10am I’ll already be out of a table. To be able to have a workspace where I can meet with brands, chat with clients, network with women in my city and have space to focus will help my business and my bottom line. I have to ask – how is it practical to arrange the books by color? In your own house I can understand that you might know where to find what you’re looking for, but in a library? Is there an index system where you can search by title or author and then know which color to go to? I’m intrigued! Honestly I’m not sure. Tuesday night was overwhelming with the crowd and I didn’t really get to see how everything works. I opened a book and there wasn’t any bar codes or stickers for organization or to track rental. But that is one of the first things I am going to find out when I go back! I am a 10 minute walk from The Wing. Give me a buzz when you want to grab coffee . . . .
What an interesting concept! Unfortunately, I can’t swing the $215 per month fee. Do they offer financial assistance? I would think they would in order to be more inclusive of a variety of women. Good for Audrey Gelman for calling out the expectation like that. She’s a businesswoman and she’s selling a service. Q. As expansion continues, are there going to be changes in pricing or additional membership levels/options? A. The Wing’s scholarship program will be launching in the coming months, and we are actively looking at introducing new membership tiers to The Wing more accessible to women at all stages of their lives and careers. Tiered membership is such a great idea. What an amazing gift to yourself! Congratulations! !